10 Cloverfield Lane is a 2016 American science fiction psychological horror film directed by Dan Trachtenberg, produced by J. J. Abrams and Lindsey Weber and written by Josh Campbell, Matthew Stuecken and Damien Chazelle. The film stars Mary Elizabeth Winstead, John Goodman, and John Gallagher Jr. It is the second installment in the Cloverfield franchise. The story follows a young woman who, after a car crash, wakes up in an underground bunker with two men who insist that an event has left the surface of Earth uninhabitable. The film was developed from a script titled The Cellar, but under production by Bad Robot, it was turned into a spiritual successor to the 2008 film Cloverfield. It is presented in a third-person narrative, in contrast to its predecessor's found-footage style. Principal photography took place under the title Valencia in New Orleans, Louisiana from October 20 to December 15, 2014. 10 Cloverfield Lane premiered in New York City on March 8, 2016 and was released in select countries on March 10. It was released in the United States on March 11, 2016, in both conventional and IMAX formats. The film received positive reviews, with many praising the performances of the cast, as well as the film's tense and suspenseful atmosphere; it grossed $110 million worldwide. After breaking up with her boyfriend Ben, Michelle drives away from New Orleans. While in rural Louisiana, she hears news reports of blackouts in several major cities before she is sideswiped by a truck and knocked off the road, falling unconscious. Michelle wakes in a locked room within an underground bunker, her wounds tended to. She is frightened as a man steps into the room and introduces himself as Howard. He tells her that he is the bunker's owner. He then explains that he brought her there for her protection, claiming that the air outside has been poisoned by nuclear or chemical fallout from an unknown force. Michelle is initially hostile towards Howard, but once she has calmed down, Howard takes her on a tour of the well-stocked bunker, and she meets Emmett, another survivor who found his way to it. Howard takes her to the viewport of the bunker's exit hatch, showing her two dead pigs outside as evidence of the fallout; Michelle also sees Howard's truck, and recognizes it from the accident. Michelle privately relays her concerns about Howard's motivations to Emmett. During their first dinner together, Michelle secretly takes Howard's keys and makes her way to the hatch, but as she is about to open it, a woman, Leslie, covered in skin lesions, slams against the window demanding she be let in, then collapses. Michelle openly returns the keys and agrees that Howard was right. Howard admits to accidentally hitting her car in his panic to get to the shelter. While the trio's relationship becomes more relaxed, Howard still shows intolerance towards Emmett and treats Michelle as a little girl; however, Howard opens up about his daughter who he states is "not with us anymore". Howard enlists Michelle to fix the air filtration unit when it fails since she is small enough to fit through the vents; while repairing it, she finds a locked skylight, with the word "HELP" scratched into its glass and visible to anyone outside. Further suspicious of Howard, Michelle and Emmett discover that Howard's purported daughter was a young girl who had gone missing about two years earlier, and they suspect he abducted her to the bunker. They make plans to escape the bunker, creating a makeshift Hazmat suit behind Howard's back. When Howard discovers tools and parts missing, he accuses the two of stealing them, threatening to immerse them in a barrel of perchloric acid. Emmett quickly takes responsibility of stealing the materials. He explains that he was building a weapon so that Howard and Michelle would respect him. Howard suddenly pulls out a gun and kills Emmett with it. He then tries to comfort Michelle, telling her that he killed Emmett to protect her. In shock, Michelle is desperately making final preparations to leave, when she is surprised by Howard. She manages to escape from him with the suit. En route, she knocks over the acid barrel, which starts an electrical fire in the bunker. It later explodes, killing Howard. Michelle dons the suit and escapes the burning bunker onto Howard's homestead. Seeing signs of living wildlife, she takes off the suit's helmet, but then she suddenly sees a giant biomechanical alien spacecraft, drawn by the bunker explosion. A quadrupedal creature drops from the craft and chases Michelle, forcing her to hide in a shed. She then races towards the farmhouse, but the craft appears and emits a green gas that forces Michelle back into the suit. Her delay allows mechanical appendages from the ship to capture her, but she is able to craft a Molotov cocktail from items in Howard's truck to throw into the ship. The fireball causes the appendage to drop her, and she is able to take the dead woman's car and escape. As she nears the Texas border she hears radio chatter instructing any survivors to head to Baton Rouge to evacuate, but also requesting the help of anyone with military or combat training in Houston. At a crossroads, she pauses a moment before driving off towards Houston. In the distance, two larger alien crafts can be seen in the sky. John Goodman, Mary Elizabeth Winstead and John Gallagher Jr.
Damien Chazelle was brought in to rewrite Campbell and Stuecken's draft and direct the film. Chazelle dropped out from directing when his Whiplash project received funding. On April 3, 2014, it was reported production for Valencia was greenlit to begin in the fall of 2014, under the direction of Dan Trachtenberg with the latest draft being written by an uncredited Daniel Casey. A budget of about $5 million was reported to be expected, in keeping with the mandate of Paramount's Insurge division of producing micro-budgeted films. On July 8, 2014, Variety reported John Goodman was in negotiations to star in the film. On August 25, 2014, they reported Mary Elizabeth Winstead had entered negotiations, and on September 22, 2014, John Gallagher Jr. reportedly joined the cast. During production, the filmmakers noticed core similarities to Cloverfield, and decided to make the picture what Abrams calls "a blood relative" or "spiritual successor" of that film. "The spirit of it, the genre of it, the heart of it, the fear factor, the comedy factor, the weirdness factor, there were so many elements that felt like the DNA of this story were of the same place that Cloverfield was born out of," said Abrams. In other interviews he explained: "Those characters and that monster [from Cloverfield] are not in this movie, but there are other characters and other monsters," and "This movie is very purposefully not called Cloverfield 2, because it's not Cloverfield 2, [...] So if you're approaching it as a literal sequel, you'll be surprised to see what this movie is. But while it's not what you might expect from a movie that has the name Cloverfield in it, I think you'll find that you'll understand the connection when you see the whole thing." Winstead and Gallagher mentioned that during production they were aware that the film had thematic similarities to Cloverfield, but did not learn that there would be an official connection until they were informed of the chosen title, only a few days before the release of the trailer. Abrams came up with the title after finishing Star Wars: The Force Awakens. During an interview with Abrams to promote 10 Cloverfield Lane, he said the creative team behind the original had some ideas on developing Cloverfield 2, but the release of films such as Godzilla and Pacific Rim led them to abandon them as they found the concept of kaiju films played out. The film's title was revealed on January 15, 2016 in a trailer attached to 13 Hours: The Secret Soldiers of Benghazi. As with Cloverfield, a viral marketing campaign was used that included elements of an alternate reality game. Bad Robot kick-started the campaign in early February 2016 by updating the Tagruato.jp website used for the original film. The campaign revealed backstory information about the character Howard Stambler and his daughter. 10 Cloverfield Lane grossed $72.2 million in the United States and $38.1 million in other territories for a worldwide total of $110.2 million. Outside North America, 10 Cloverfield Lane received a staggered release, across 54 countries. It earned $1.5 million in its opening weekend from six international markets with a bulk of it coming from Australia ($1 million). Overall, the top openings were in the United Kingdom and Ireland ($2.2 million), South Korea ($1.7 million), and France ($1.4 million). 10 Cloverfield Lane received positive reviews from critics. On Rotten Tomatoes, the film has a rating of 90% based on 289 reviews, with a weighted average score of 7.5/10. The site's critical consensus reads, "Smart, solidly crafted, and palpably tense, 10 Cloverfield Lane makes the most of its confined setting and outstanding cast—and suggests a new frontier for franchise filmmaking." Metacritic gives the film a score of 76 out of 100, based on 43 critics, indicating "generally favorable reviews". Audiences polled by CinemaScore gave the film an average grade of "B–" on an A+ to F scale. Having originally planned the film as a direct sequel to Cloverfield, Abrams suggested that he had thought of something which, if they were lucky enough to get it made, "could be really cool [insofar as it] connects some stories" in a third film, even teasing a larger Cloverfield universe. Interviews with Trachtenberg and Winstead confirm that the movie is, and always was intended to be, an expansion of the first film, with Trachtenberg calling it the "Cloververse". Winstead has voiced her interest in returning for another installment. In October 2016, it was revealed that the Abrams-produced God Particle would be the third installment in the Cloverfield franchise. After several postponements of the film's release date, it was released as a Netflix Original on February 4, 2018, under the new title The Cloverfield Paradox. In The Cloverfield Paradox, Donal Logue cameos as Mark Stambler, a conspiracy theorist discussing the "Cloverfield Paradox"; reviewers observed that the character shares the same surname as Howard Stambler in 10 Cloverfield Lane. Suzanne Cryer, who appeared as Leslie in 10 Cloverfield Lane, also appears in a brief cameo role as a newscaster who interviews Stambler. ^ "10 Cloverfield Lane (12A)". British Board of Film Classification. March 9, 2016. Retrieved March 9, 2016. ^ "2016 Feature Film Study" (PDF). FilmL.A. Feature Film Study. Film L.A.: Page 23 May 23, 2017. Retrieved August 14, 2018. ^ Lee, Benjamin (March 15, 2016). "Has 10 Cloverfield Lane broken the movie trailer template?". The Guardian. Retrieved March 15, 2016. ^ Lang, Brent (March 9, 2016). "Box Office: 'Zootopia' to Trample '10 Cloverfield Lane,' 'Brothers Grimsby'". Variety. Retrieved March 9, 2016. ^ a b "10 Cloverfield Lane (2016)". Box Office Mojo. Internet Movie Database. Retrieved May 30, 2016. ^ a b Emma Thrower. "Exclusive: J.J. Abrams talks 10 Cloverfield Lane". Empire. Retrieved February 26, 2016. ^ a b "Tagruato Corporation - Employees of the Month: February 2016". Archived from the original on February 10, 2016. Retrieved February 10, 2016. Tagruato.jp Archived 2008-02-15 at the Wayback Machine is a website that was first used by the makers of Cloverfield in its viral marketing campaign. ^ "How 10 Cloverfield Lane Landed An A-Lister For A Mystery Cameo". cinemablend.com. Retrieved March 8, 2016. ^ "The Cellar". Spec Scout. Retrieved January 16, 2016. ^ a b "THE HIT LIST 2012 (FULL LIST)". The Tracking Board. Retrieved January 16, 2016. ^ "THE HIT LIST". The Tracking Board. Retrieved January 16, 2016. ^ Sciretta, Peter (September 22, 2014). 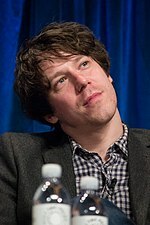 "John Gallagher Jr. Joins John Goodman & Mary Elizabeth Winstead in Dan Trachtenberg's Bad Robot Movie 'Valencia'". /Film. Retrieved January 16, 2016. ^ Shaw, Lucas (April 3, 2014). "Paramount's Insurge, Bad Robot Greenlight Low-Budget Thriller 'Valencia' (Exclusive)". TheWrap. Retrieved January 16, 2016. ^ Kroll, Justin (July 8, 2014). 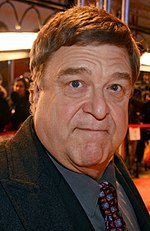 "John Goodman in Talks to Star in Bad Robot's 'The Cellar' (EXCLUSIVE)". Variety. Retrieved January 16, 2016. ^ Kroll, Justin (August 25, 2014). "Mary Elizabeth Winstead to Star in 'The Cellar' for Paramount and Bad Robot". Variety. Retrieved January 16, 2016. ^ Kroll, Justin (September 22, 2014). "'Newsroom' Actor Joins Paramount and Bad Robot's 'The Cellar' (EXCLUSIVE)". Variety. Retrieved January 16, 2016. ^ "10 Cloverfield Lane and the 6 steps to making a secret movie". Entertainment Weekly's EW.com. Retrieved 26 February 2016. ^ a b "10 Cloverfield Lane Trailer Reveals J.J. Abrams Sequel". Collider. 15 January 2016. Retrieved 26 February 2016. ^ a b "J.J. Abrams Q&A: 10 Cloverfield Lane and his post-Force Awakens path - EW.com". Entertainment Weekly's EW.com. Retrieved 26 February 2016. ^ a b c Erik Davis. "Exclusive: J.J. Abrams Talks '10 Cloverfield Lane' and Its Connection to the Larger 'Cloverfield' Universe". Fandango. Retrieved 26 February 2016. ^ Julian Roman (8 March 2016). "'10 Cloverfield Lane' Cast & Director Unveil the Big Secret - EXCLUSIVE". MovieWeb. Retrieved 8 March 2016. ^ "10 Cloverfield Lane Cameo: A-Lister's Secret Role Revealed". Slashfilm. Retrieved 9 March 2016. ^ "10 CLOVERFIELD LANE interviews - John... - Kevin McCarthy FOX - Facebook". facebook.com. Retrieved 9 March 2016. ^ "10 Cloverfield Lane: Bear McCreary on the Score, J.J. Abrams". Collider. 8 March 2016. Retrieved 9 March 2016. ^ "'10 Cloverfield Lane' Director Dan Trachtenberg On His Mysterious Film". UPROXX. Retrieved 9 March 2016. ^ Radish, Christina (March 10, 2015). "Mary Elizabeth Winstead Talks 'Faults' and 'Valencia'". Collider. Retrieved January 16, 2016. ^ Ellingson, Annlee (March 14, 2015). "Paramount shuts down low-budget Insurge division". L.A. Biz. Retrieved January 16, 2016. ^ Derschowitz, Jessica (January 30, 2016). "10 Cloverfield Lane: Mary Elizabeth Winstead teases secretive new film". Entertainment Weekly. Retrieved January 30, 2016. ^ "Bad Robot's 'Valencia' Starring John Goodman Now Filming and Hiring Crew in New Orleans". projectcasting.com. September 26, 2014. Retrieved November 25, 2015. ^ a b Emma Thrower. "10 Cloverfield Lane director Dan Trachtenberg on Bad Robot and fan theories". Empire. Retrieved 2 March 2016. ^ Menard, Jonathan (December 1, 2014). "'Explosive' thriller set to rock Hahnville". St. Charles Herald-Guide. Retrieved January 18, 2016. ^ "On The Set, - Box Office ... Abrams Wraps The Cellar, Tom Hiddleston Finishes I Saw the Light & More". ssninsider.com. December 15, 2014. Archived from the original on September 24, 2015. Retrieved December 16, 2014. ^ "'10 Cloverfield Lane' Soundtrack Details - Film Music Reporter". filmmusicreporter.com. Retrieved March 8, 2016. ^ Giroux, Jack (February 19, 2016). "'10 Cloverfield Lane' Viral: What's in the Box?". /Film. ^ "10 CLOVERFIELD LANE IMAX® GIVEAWAYS". IMAX. Retrieved March 25, 2016. ^ "10 Cloverfield Lane - ComingSoon.net". ComingSoon.net. Retrieved March 25, 2016. ^ Anthony D'Alessandro (March 11, 2016). "Audiences Start Screaming For '10 Cloverfield Lane' On Thursday". Deadline Hollywood. Retrieved March 11, 2016. ^ Scott Mendelson (March 11, 2016). "Box Office: '10 Cloverfield Lane' Scares Up $1.8M Thursday". Forbes. Retrieved March 11, 2016. ^ Pamela McClintock (March 11, 2016). "Box Office: '10 Cloverfield Lane' Devours 'Brothers Grimsby' With Huge $1.8M Thursday Night". The Hollywood Reporter. Retrieved March 11, 2016. ^ Scott Mendelson (March 12, 2016). "Friday Box Office: '10 Cloverfield Lane' Adds $9M To Its Mystery Box, 'Brothers Grimsby' Bombs". Forbes. Retrieved March 12, 2016. ^ Scott Mendelson (March 13, 2016). "Weekend Box Office: '10 Cloverfield Lane' Scares Up $25M While 'Brothers Grimsby' Flops Hard". Forbes. Retrieved March 13, 2016. ^ a b Nancy Tartaglione (March 13, 2016). "'Allegiant' Pledges $26.7M; 'Zootopia' Hops With $83M 5th Frame – Intl B.O. Update". Deadline Hollywood. Retrieved March 14, 2016. ^ "Global Sites and Relesse Date". Retrieved April 6, 2016. ^ Nancy Tartaglione (March 20, 2016). "'Zootopia' Zooms To $592M Global; Sets Animation Record In China Where 'The Revenant' Rides With $33M – Intl B.O." Deadline Hollywood. Retrieved March 20, 2016. ^ "10 Cloverfield Lane (2016)". Rotten Tomatoes. Fandango. Retrieved December 4, 2018. ^ "10 Cloverfield Lane Reviews". Metacritic. CBS Interactive. Retrieved March 16, 2016. ^ "Audiences Booking Trips To 'Zootopia' & '10 Cloverfield Lane'". Deadline Hollywood. ^ Zwecker, Bill (March 10, 2016). "'10 Cloverfield Lane': Tense and twisty beneath the surface". Chicago Sun-Times. Retrieved March 24, 2016. ^ Catsoulis, Jeannette (March 10, 2016). "Review: '10 Cloverfield Lane' Houses a Survivalist, His Captive and Jolts". New York Times. Retrieved March 24, 2016. ^ Scherstuhl, Alan (March 9, 2016). "The Final Final Girl: Mary Elizabeth Winstead Outfoxes the End-Times in '10 Cloverfield Lane'". Village Voice. Retrieved March 24, 2016. ^ Bowen, Chuck (March 11, 2016). "10 Cloverfield Lane". Slant Magazine. Retrieved March 24, 2016. ^ Andersen, Soren (March 10, 2016). "'10 Cloverfield Lane': Horror flick stays too long in the basement". Seattle Times. Retrieved March 4, 2016. ^ Verniere, James (March 11, 2016). 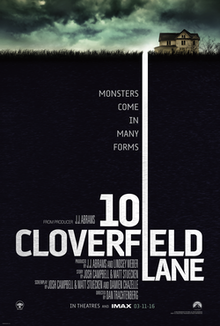 "'10 Cloverfield' moves at a slow, stupid pace". Boston Herald. Retrieved March 24, 2016. ^ "2016 Bram Stoker Awards Final Ballot". Horror World. 23 February 2017. Retrieved 26 February 2017. ^ Hipes, Patrick. "DGA TV Awards Nominations: 'Stranger Things', 'Westworld' & 'Atlanta' On List; Docus Include 'OJ: Made In America'". Deadline Hollywood. Retrieved January 11, 2017. ^ Pape, Danny (February 7, 2017). "Star Wars: Rogue One Leads Empire Awards 2017 Nominations". Flickreel.com. Retrieved March 3, 2017. ^ "Never mind Oscar, here's the 2017 FANGORIA Chainsaw Awards Nominees Ballot!". FANGORIA®. Retrieved 14 February 2017. ^ "Golden Tomato Awards - Best of 2016". Rotten Tomatoes. 12 January 2017. ^ McNary, Dave (November 2, 2016). "'La La Land' Scores Three Hollywood Music in Media Nominations". Variety. Retrieved November 3, 2016. ^ Greene, Steve (December 19, 2016). "2016 IndieWire Critics Poll: Full List of Results". IndieWire. Retrieved December 27, 2016. ^ "2016 StLFCA Annual Award Nominations". St. Louis Gateway Film Critics Association. December 12, 2016. Retrieved December 12, 2016. ^ "Cloverfield: J.J. Abrams already knows what the third movie would be - EW.com". Entertainment Weekly's EW.com. Retrieved 26 February 2016. ^ "More Cloverfield Films For Mary Elizabeth Winstead? Here's What She Said - CINEMABLEND". CinemaBlend. Retrieved March 16, 2016. ^ a b Shepherd, Jack (February 7, 2018). "The Cloverfield Paradox: All the Easter Eggs, cameos and references to other Cloverfield films". The Independent. Retrieved February 9, 2018. This page was last edited on 20 April 2019, at 05:13 (UTC).